In responding to the United States (U.S.) Nuclear Regulatory Commission’s Order EA-12-049 Issuance of Order to Modify Licenses with Regard to Requirements for Mitigation Strategies for Beyond-Design-Basis External Events, many of the operating nuclear power plants have identified a need to evaluate the robustness of certain on-site, liquid-contained storage tanks. Because many of these storage tanks were not originally designed for their site’s licensing-basis tornado event, the present evaluations must address the effects of wind-driven missile impact on storage tank structural integrity and inventorysecurity. 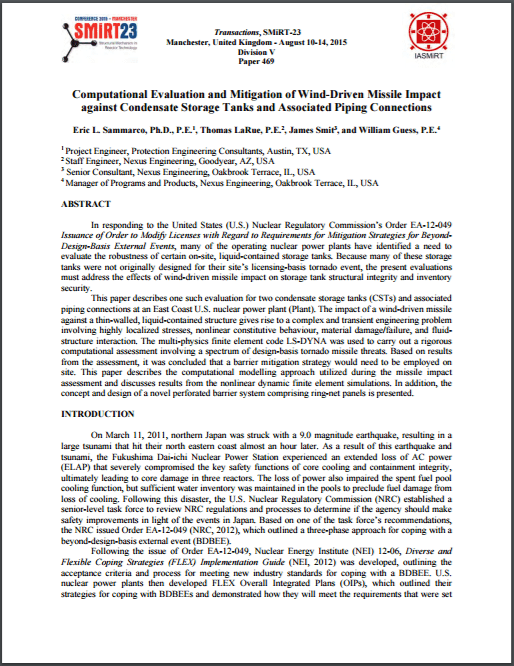 This paper describes one such evaluation for two co ndensate storage tanks (CSTs) and associated piping connections at an East Coast U.S. nuclear power plant (Plant). The impact of a wind-driven missile against a thin-walled, liquid-contained structure gives rise to a complex and transient engineering problem involving highly localized stresses, nonlinear constitutive behaviour, material damage/failure, and fluidstructure interaction. The multi-physics finite element code LS-DYNA was used to carry out a rigorous computational assessment involving a spectrum of design-basis tornado missile threats. Based on results from the assessment, it was concluded that a barrier mitigation strategy would need to be employed on site. This paper describes the computational modelling approach utilized during the missile impact assessment and discusses results from the nonlinear dynamic finite element simulations. In addition, the concept and design of a novel perforated barrier system comprising ring-net panels is presented. Read the Full Paper by Dr. Eric Sammarco, P.E., Thomas LaRue, P.E., James Smit and William Guess, P.E.